What is the point in a furnace tune-up? It’s getting close to that time of year where you start to hear the ads on the radio telling you that you need to get your furnace cleaned or inspected before fall and winter comes, which was usually met with me rolling my eyes and changing the station to some tunes, not giving it a second thought. Come to think about it, we don’t really think about our systems until they break down. What if I told you that getting your system cleaned once a year could have prevented that? There is numerous things that can happen if you don’t maintain your system and breaking down is one of them. Furnaces tend to break down when we need them the most because that’s when they are working the hardest. If you don’t have your system inspected every year, your furnace runs a much higher risk of breaking down in the middle of winter because it will be operating with issues that would have otherwise been taken care of during your tune-up. Have you ever wondered why we tend to get more sick in the fall and winter than we do summer time? Or why there is more dust right after you turn on the heat? When you don’t maintain you furnace – it doesn’t take long for the air filter to become clogged with dust, debris, and even mold. 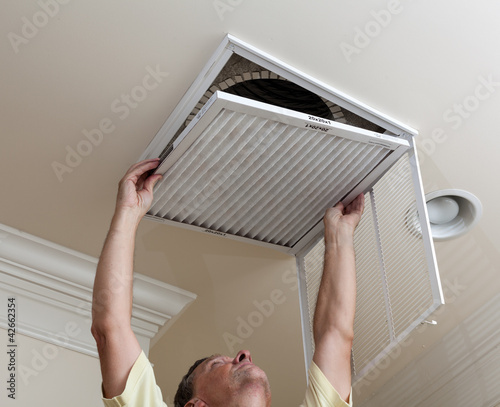 Once the air filter can no longer keep particles out, your furnace (and ducts) become blanketed with nasty airborne residue. Now stop to realize that you are breathing that in every time your furnace cycles. People with asthma or other breathing difficulties could be in danger if their system isn’t properly cleaned and cared for. Often times, furnace problems start small and get much worse over time. If you don’t get a furnace tune-up, you likely won’t notice problems with your system until it starts acting up. By that time, a relatively small repair that could have been taken care of during a tune-up can turn into a much bigger and more expensive repair. One of the most important parts of a furnace is the heat exchanger because it removes the poisonous gases that result from the combustion process and vents them out and away from the residence. The heat exchanger expands and contracts since temps can change in the furnace after each cycle. Over time this can produce cracks, allowing poisonous carbon monoxide gas to escape. Having your furnace annually inspected and cleaned not only elongates the life of your system but it could possibly save you from a deadly situation.